Pair of full length Watercolor Portraits . . . sitters identified as Mr. and Mrs. Oliver of Watertown, New York. 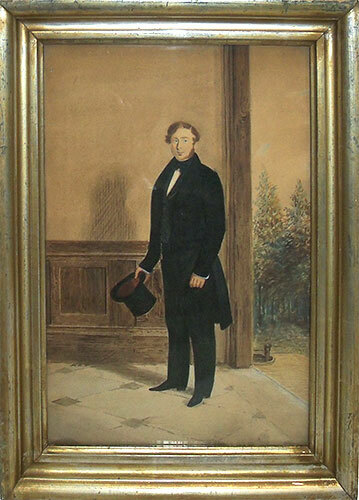 Watercolor portraits that show the sitter in an interior are very desirable. 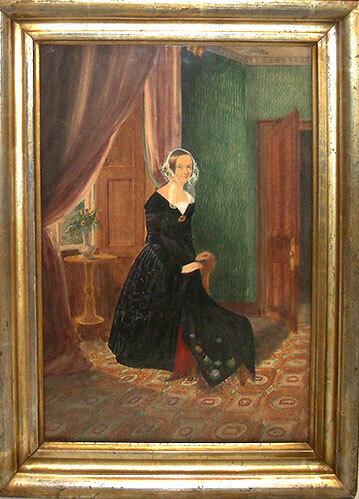 The handwriting on the reverse, written by her grandson, identifies the lady as the mother of Jessie Oliver Warren (b. 1865) who was the mother of James Warren (1884-1970) who provided the information. They are beautifully painted and highly desirable examples that show the dress of the day as well as the interior room furnishings. It is very evident that the Olivers were a couple of obvious means, reflecting the Victorian opulence in both their dress and their furnishings.